The FeatherLite™ Cobalt-57 Rectangular Flood Source weighs up to 60% less than other flood sources. Lower weight means less strain to the back and greater maneuverability. 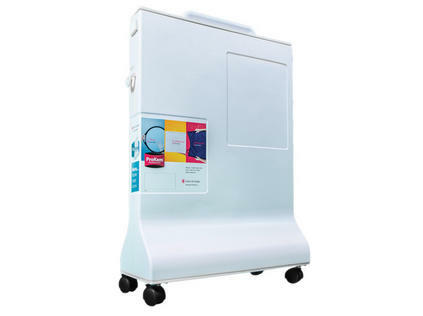 This flood source provides a uniform field of radiation for evaluation of nuclear medicine gamma camera performance, allowing detection and correction of any camera malfunction prior to diagnostic use. The typical useful life of the Co-57 flood source is approximately two years. The Co-57 flood source meets the standards established by the manufacturers of the gamma cameras. The flood source is shipped with a lead-lined cardboard container. 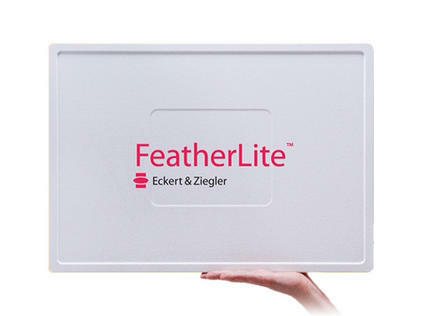 An optional case is available for the FeatherLite™ flood source. The optional ProKase™ Flood Shield for highly portable flood source storage and handling is designed to be more mobile, more stable and much easier to use than typical cases. Its unique flared base makes it less likely to tip as you maneuver through the tightest areas. Regardless of the layout of your facility, ProKase makes quality control safer, easier and more efficient. FREE disposal when you purchase a NEW flood source from Biodex (applies to United States Only).